The image that appears to the right is a reproduction of the painting Swiss Alps with Clouds (2) by California artist Yoju. 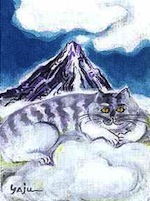 Swiss Alps with Clouds (2) is one of a series of six watercolors featuring The Catland Cat. Catland is proud to have this piece in its private collection and grateful to the artist for her permission to use it as the Catland mascot. We are delighted to present a collection of Yoju's original watercolors and limited edition prints for sale to Catland customers. We are sure you will find Yoju's work as exciting as we do. Born in Hokkaido, Japan, and raised in Tokyo, Yoju first expressed an interest in art at the age of 4. She began formal study at the age of 8 at the Maejima Academy of Art, Tokyo where she continued for 25 years. Additional studies in Calligraphy with the well known instructor, Fujo Minami, Tokyo, were conducted throughout her primary and high school years. After high school followed three years of intensive study at the Kuwasawa and Ootsuka Academy of Design, Tokyo, and an additional 4 years of study at the Pacific Ocean Academy of Art, Tokyo. During the first 25 years of her career, Yoju concentrated on oil painting as her principle medium. In 1980 she made a significant shift from oil to her current medium which includes gouache, water soluble pencil and crayon, pastel, China ink, suminagashi (water prints), and collage. During the latter part of her oil painting period and early part of her current period her work has been exhibited at numerous galleries as well as in group and solo exhibitions in Japan. At the present time, Yoju's art studio is located in Saratoga, CA.